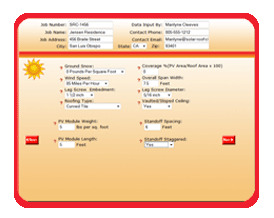 In Step 1, you will enter Job Number, Job Name, Job Address, PV Module size and with, Roofing Type, etc. For site specific information such as Ground Snow, and Wind Speed, contact the (AHJ) Authority Having Jurisdiction in your local Building Department. 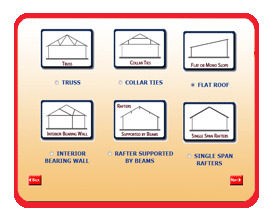 In Step 2, you will select the Roof Type for your project. This selection defines the type of roof for your project. Your project may not exactly match these choices, so just select the most similar Roof Type. 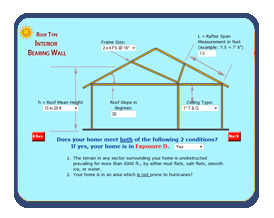 In Step 3, you will input the Roof Information for your project. This includes Rafter size and spacing (E.g. 2x4 @ 24”), Roof Slope, Rafter Span, Ceiling Type, etc. You are now ready to have 7 Code required Loading Combinations calculated using your input values, to determine the structural adequacy of the roof for this project. If the project is Non-Code-Compliant, you will be able to review, verify and edit your input.